Slash has confirmed that he and Axl Rose are on friendly terms again after decades of public animosity. "It was probably way overdue, you know,” Slash tells Sweden’s Aftonbladet TV (video below). “But it's…. you know, it's very cool at this point. You know, let some of that, sort of, negative… dispel some of that negative stuff that was going on for so long." 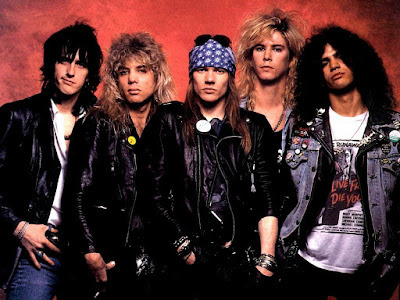 Guns N’ Roses recently underwent a lineup change when guitarist DJ Ashba announced his departure from the group last month after six years with the band as he moves forward to focus on Sixx:AM. A recent report also revealed that guitarist Ron ‘Bumbelfoot’ Thal left the group in 2014, leaving the current Guns N' Roses lineup with Rose, keyboardist Dizzy Reed, bassist Tommy Stinson, guitarist Richard Fortus, drummer Frank Ferrer, and keyboardist/bassist Chris Pitman as the remaining members. Currently on hiatus from touring, Guns N’ Roses last live performances were part of a spring 2014 residency at the The Joint at the Hard Rock Hotel and Casino in Las Vegas.